Have you ever wanted the advantage of lightweight travel and sleeping without a tent, but still want to be protected from rain, wind, and bugs? Enter the bivy sack. A bivy sack, which is short for “bivouac sack”, offers less space and bulk than a tent but provides a shelter from the elements. In order to choose the best bivy sack for you, it is important to first know what features you are looking for in a bivy sack to make sure that you choose one that will suit its purpose. Bivy sacks are not for everyone, as most casual campers and backpackers prefer to sleep in a tent where they have more space and an area to keep their gear out of the weather. 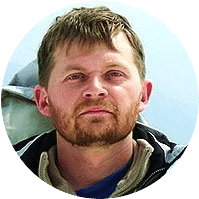 However, using a bivy sack is especially advantageous to those who need to travel very lightly, such as ultralight solo backcountry travelers, multi-day big wall climbers, and people on bike tours. Since they usually are not insulated, they don’t add much warmth when you’re sleeping, but average around 10 degrees warmer than if you were sleeping without one. Bivy sacks come in a wide variety of designs, but most of them have a durable, tear-resistant bottom and a more breathable but waterproof top portion. Many have reinforced seams and zippers to help prevent water entry. Zipper placement differs between designs, as well. Some have zipper placements designed to allow you to sit up more easily or create openings to stick your arms through. 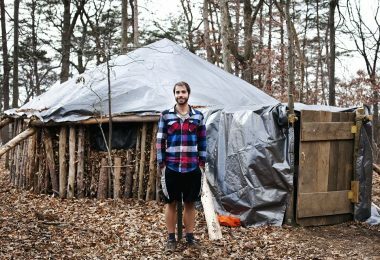 That can be a major benefit when you set up camp and want to conserve body heat by getting in your sleeping bag right away, but still need to do camp chores like cooking dinner or repairing gear. One design feature of some bivysis that they include a wire or small pole to lift the material away from your face. This can help ease claustrophobia as bivy sacks lacking this quality can feel restrictive to some people. It is also necessary for protection from bugs because bug mesh works best when it is pulled away from the skin. A bug bivy such as the Outdoor Research one we included in this review is designed for preventing bug bites, but it is not waterproof since it is made of mesh. Most bivy sacks are designed to be large enough to accommodate a sleeping bag and/or sleeping pad, but when it is very warm at night you can forgo the sleeping bag and simply sleep inside the bivy in case rain is possible. 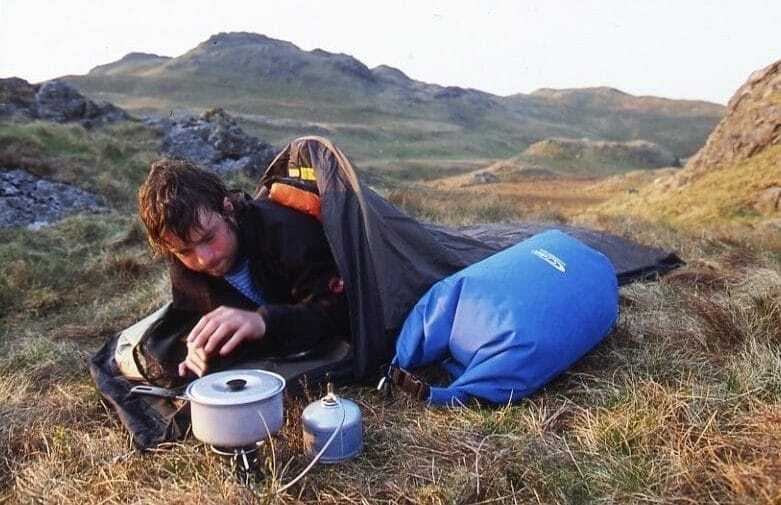 Something to consider when deciding whether a bivy sack is right for you is condensation. Because your warm breath condenses and becomes liquid when it meets colder air, condensation can build up inside a bivy just like it can with a tent. If it isn’t raining, you have more freedom to open zippers and ventilate the bivy more effectively. Gore-Tex, the material commonly used to make up the top of a bivy, is a waterproof and breathable material that allows water vapor to exit the fabric. Even when it is rainy, you can use various pieces of equipment and fabric to make a waterproof layer at zipper closures that allow vapor to escape and prevent precipitation from entering the bivy. A bivy sack is useful for when you are on a solo trip or when there is only enough room on a ledge to fit one person at a time. 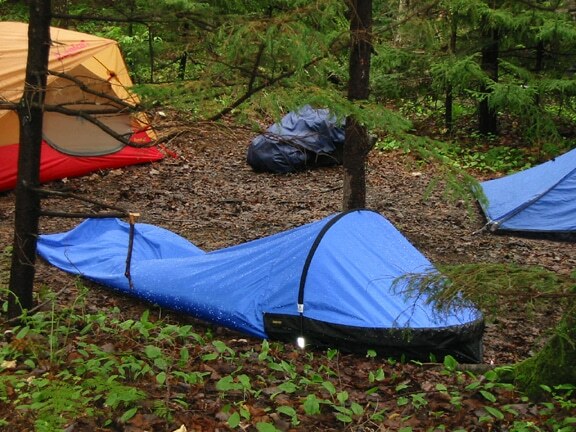 For trips with more than one person, it is more efficient to use a shared tent than a bivy sack. You can also use a tarp in conjunction with a bivy sack to reinforce your shelter, particularly for the mesh bug bivy designs that offer little to no protection from precipitation. In this article, we have compiled a list of different types of bivy sack reviews for you to compare and find the one that suits your adventure needs. The Military Modular four piece sleep system is unique in that its different components can be used separately or together for different situations. The lightweight patrol bag can be used by itself as a cover for sitting outside on cool nights or for camping on warmer nights when you don’t need a fully insulated bag. If you do need something more substantial, the warmer bag can be placed inside the lightweight bag. The bags snap together to keep them in line and prevents tangling between the bags. For even colder conditions, both the lightweight and intermediate quilt-like bag can be tucked into the Gore-Tex bivy, and the whole system comes with a compression sack to keep it contained. This system was designed by the US Military to keep a soldier warm in a variety of conditions, including rain thanks to the Gore-Tex bivy. 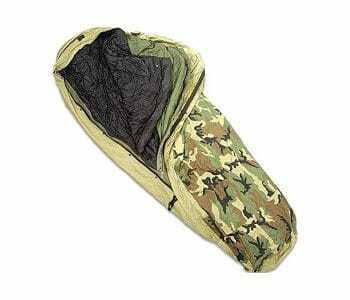 This system is heavy and has acomparable warmth to more modern sleeping bags that are much lighter. However, since the US military recently transitioned to a newer sleeping system to issue to personnel, it can be relatively easy to find this model on the market. Related: The Tennier Industries US Military -30 Degree Rating Mummy Style Sleeping Bag is another warm, military-style sleeping system. The Survive Outdoors Longer emergency bivy is designed for emergency use and for preserving body heat in adverse conditions. 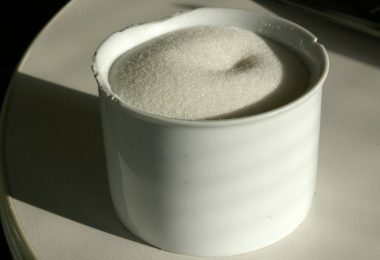 At only 3.5 ounces, it is small enough to take with you on any trip or to stow in your car. It is made of polyethylene, which is tear resistant and reflects body heat back to you for efficiency. 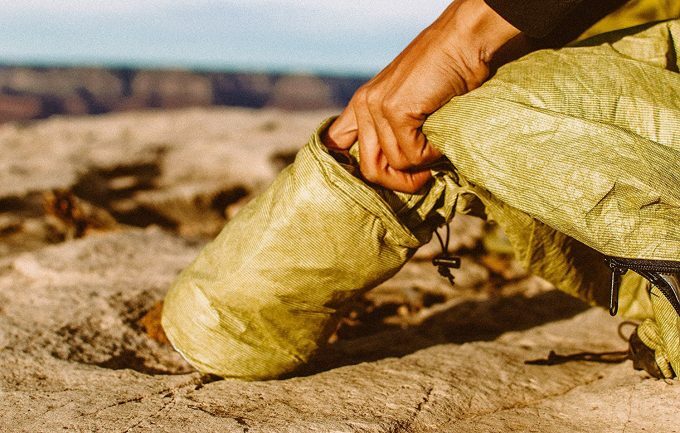 It also includes a stuff sack to store in pockets or backpacks, making it small enough to take even on day hikes. The sealed seams help to protect the user from the elements by preventing rain, snow, wind and mud from entering the bag through the seams. This bag is not insulated and is not intended to be used as a sleeping bag, but it can be used in emergencies as protection against the elements and would be even more effective when paired with warm clothing or a blanket. Its neon orange color is designed to make it more visible to potential rescuers. 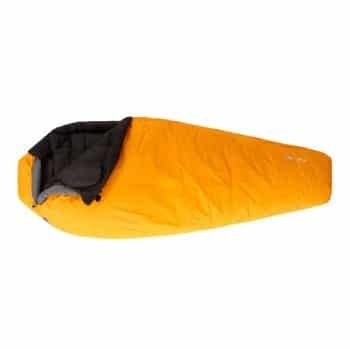 This bivy is similar to an emergency blanket except that its tubelike design and sealed seams make it more effective for keeping out wind and rain. The downside of this is that you can only fit one person inside, while for an emergency blanket you can cover multiple people. 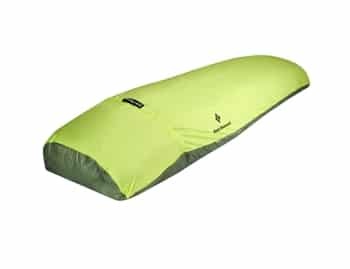 But at such a light weight and small size, this bivy is convenient enough to bring one along for everyone in your party. RELATED: The Adventure Medical Emergency Blanket is similar to the Survive Outdoors Longer emergency bivy because it provides similar body heat retention, but it is a blanket instead of a bivy. 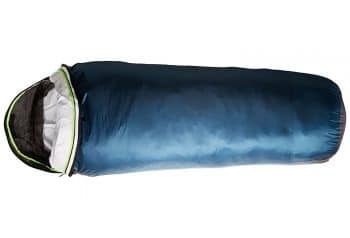 The Mountain Hardwear Wraith sleeping bag is unique because it is a cross between a waterproof and windproof bivy sack and a super warm sleeping bag. It is designed to hold up in extreme weather conditions and has a comfort rating of minus 20 Fahrenheit. The Wraith gets its great insulation from 800-fill goose down with a fill weight of 38 ounces. This Q Shield goose down is treated during the manufacturing process to resist moisture and to retain loft. The shell of the bag is ripstop nylon, which is waterproof and windproof. The zipper flap is laminated to help prevent leakage of water or snow into the bag. This bag is manufactured in a mummy bag design, which is helps to maximize efficiency and weight. 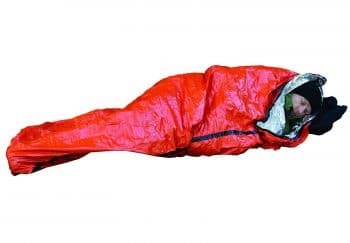 While it does not come with a bug net or poles, this sleeping bag is built to be able to withstand harsh conditions, made with its waterproof shell material and zipper construction. The Wraith costs around $900 but does have a great design and holds up to extreme weather very well.At almost 5 pounds, it is a bit heavy for casual backpacking but would be worth it if you need to sleep outside in cold and wet weather. RELATED: The Mountain Hardwear Phantom Flame Sleeping Bag is not as weatherproof as the Mountain Hardwear Wraith, but it is another very warm and insulated sleeping bag. The Outdoor Research Alpine bivy is unique because it is built with the same features that a tent provides, but allows you to skip the extra bulk and weight of packing a tent. Like other Outdoor Research products, the Alpine bivy is designed with several weatherproof features such as Gore-Tex fabric, taped waterproof seams, a Hydroseal coated nylon floor and a mesh material at the opening to help prevent bug bites but still allow for ventilation. There is one overhead pole that keeps the bivy sack off of your face, and the section at the feet has a higher volume and is 14.5 inches high to allow for more natural foot movement and positioning. The Alpine also comes with stake loops and a guyline loop to secure the bivy outdoors. The Alpine is known for doing a great job of keeping its user dry. This is a great choice for solo missions where having a tent is cumbersome or you just want to save space and weight by sleeping in a bivy instead of a tent. RELATED: The Outdoor Research Helium Bivy also has an overhead pole to keep the fabric away from your face while you sleep. The Black Diamond Twilight bivy is designed as a minimalist piece of gear to keep you dry and out of the wind in bad weather. It does not have any frame, so this helps to cut down on weight. 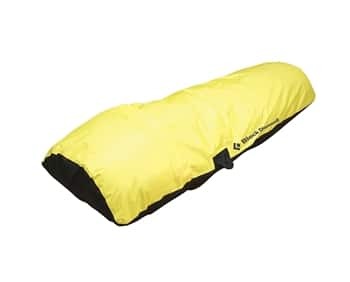 It is large enough to fit a sleeping bag and sleeping pad and should be thought of more as an emergency shelter or sleeping bag cover. The Twilight is made of NanoShield single-wall fabric, which is designed to be breathable and soft. This shell is coated with silicone nanocell, which is durable and resistant to most tears. Breathability is important to the design of the Twilight, as the NanoShield material is designed to be breathable and there are mesh panels at the zippers to help improve ventilation. Since it packs down to only 3 x 5 inches, the Black Diamond Twilight is a great gear item to bring along on outdoor adventures including backpacking. RELATED: The Outdoor Research Molecule Bivy is a similar size to the Black Diamond Twilight and is also made from waterproof and breathable nylon. It also features a vented foot box and fully taped seams as well as an anti-fungal coating. The Black Diamond hooped bivy sack has been used by climbers and alpinists for a long time, and its design incorporates many features that make it an excellent choice for climbers or backpackers who choose not to carry a tent. At only 26 ounces, the hooped bivy sack is very lightweight, which is important for climbing. Its main construction is manufactured from Todd-Tex fabric, which is water resistant and breathable. The seams are taped to keep water from entering the bivy through the seams. 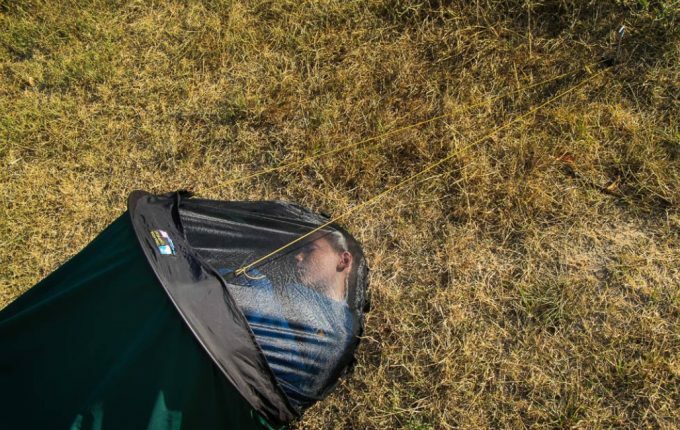 One unique feature of the Black Diamond hooped bivy is the hoop itself, which is a wire that is sewn into the space above your head in order to improve airflow and decrease condensation, giving you more room around your head. It also features a mesh panel to reduce condensation and keep bugs out, and features external loops to assist in anchoring the bivy to ledges or the ground. This bivy has a full-strength tie in point so you can stay clipped in, and it is roomy enough to allow you to store gear like boots inside. While it is a great piece of gear for climbers and alpinists, many ultralight backpackers choose this bivy as a tent replacement, as well. RELATED: The Black Diamond Spotlight Bivy is an ultralight bivy that also includes a hooped feature around the head. 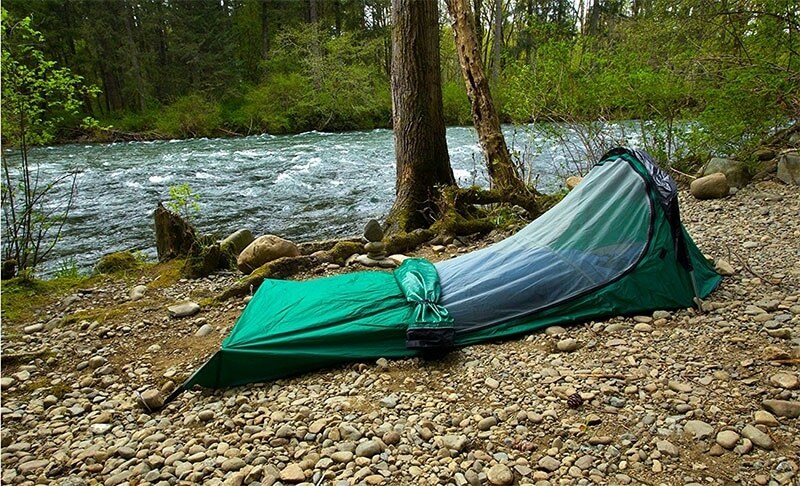 The Outdoor Research bug bivy is true to its name: it is designed for keeping bugs off! The entire top part of the bivy is made of mesh to stay breathable and cool, but the floor is manufactured from Hydroseal material to keep it waterproof. It also has a seam-taped floor for better waterproof qualities. To keep the mesh off of your face, this bug bivy has a single pole system to loft the mesh high above your face. This is important to prevent bugs from biting you through the mesh. It comes with three stake loops, sleeping pad straps, and two guy line loops as well as a mesh pocket on the inside. 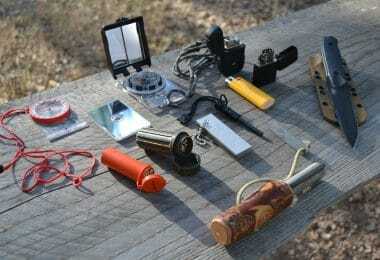 At one pound, it is a lightweight piece of gear that makes it ideal for river trips or backpacking. 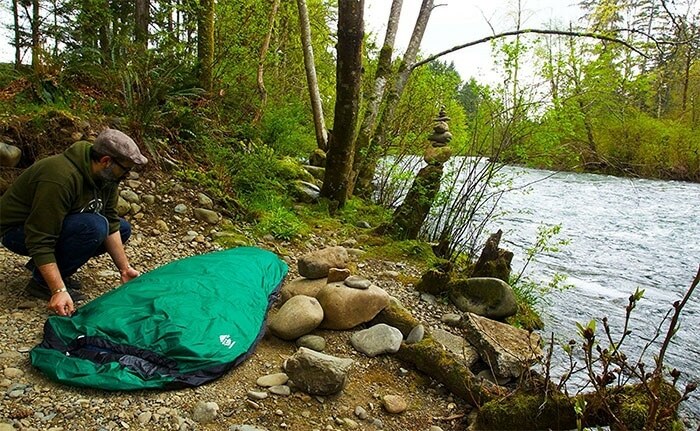 The bivy is designed to fit a sleeping bag and sleeping pad inside. This bivy is easy to get in and out of and is roomy enough to allow you to get dressed and undressed inside. While this will definitely not keep rain off of you, you can use it in conjunction with a lofted tarp to prevent both rain and bugs for comfortable sleeping. 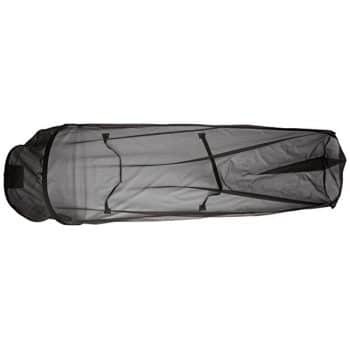 RELATED: The Catoma Adventure Shelters Improved Bed Net System is less expensive than the Outdoor Research bug bivy but also provides a single-person bug net. Using a bivy sack instead of a tent can be a great choice for anyone in need of a minimalist, lightweight piece of gear. A bivy sack helps to keep you and your sleeping bag out of the rain, snow, and wind and can help protect you from bug bites. If its small and sometimes restrictive size does not bother you, replacing a tent with a bivy sack can be a great way to travel light on the trail, the road or the wall. Bivy sack designs vary widely, so understanding what you will be using yours for and then choose a bivy sack that has the necessary features is important. If you have a favorite bivy sack that we did not include in this review, please feel free to let use know in the comments!